The central character in The Husband is a gardener named Mitch Rafferty. He is a good gardener, but like many gardeners, he is not rolling in money. In fact, Mitch only has about eleven thousand dollars in the bank. That’s pretty good for a gardener, but not good enough. Mitch needs two million dollars and he only has sixty hours to find it. Why does a gardener need so much money? Not to buy a couple of new spades and thirty feet of garden hose, that’s for sure. Mitch needs the money to get his wife back. The call comes in at 11:43 on a Monday morning. Mitch is busy putting empty plant pots onto the back of his pickup. When he answers his mobile his wife Holly tells him that she loves him. Whatever happens, she loves him. Then she screams and Mitch isn’t talking to Holly anymore. The man who replaces her is cool and calm and very good at making Mitch’s wife scream. If Mitch doesn’t come up with the cash, or if he goes to the police, the kidnapper promises to cut off Holly’s fingers, one by one, before cutting out her tongue and eyes and leaving her to die slowly. He is a nasty guy and he tells Mitch all this without the slightest hint of emotion. To him, it is just business and just to make sure that Mitch realizes that he means business the guy on the phone says, “See that guy across the street?” Mitch turns, to look at the guy across the street, just in time to see him take a headshot and hit the deck. Dead. The guy on the phone knows how to make a point, and although Mitch is a good gardener he is an even better husband and there is no way that he will allow anything to happen to Holly. A man has just been gunned down in broad daylight so it is not long before the police arrive, but Mitch cannot tell them the truth. He has to pretend to be as baffled as they are about what has happened. The guy was walking his dog for Christ’s sakes and neither one of them had left a mess on the sidewalk. Well, not until the bullet took away half the guy’s face. One of the detectives, Sandy Taggart, seems pretty shrewd. Mitch realizes he will have to be very careful when talking to him, but the guy is like a bloodhound. A man has been killed and it seems like Taggart is going to hound Mitch until he finds out why. The Husband is 453 pages of nonstop action. Mitch barely has time to stop and take a breath. He’s on a tight deadline, the kidnappers have got him pretty much boxed in whichever way he turns, and they have managed to make it look like he has killed his wife. So if Mitch doesn’t come up with the money he will lose the woman he loves and be charged with her murder as well. He can’t go to the police. Not even Taggart. For all Mitch Knows Taggart could be in with the kidnappers because they appear to have Mitch under constant surveillance. In the end, Mitch is forced to turn to his brother, Anson, for help, only to discover Anson has a rather surprising secret. I enjoyed reading The Husband and can honestly say I have never read a book quite like it. There are any number of stories about people being held to ransom, but I have never read one where the abducted person is the wife of a normal working class man. What a great idea! If there is one question that the reader is forced to ask themselves while reading The Husband, it is probably this: how far would you be prepared to go to save someone you love? Well . . . think about it. How far? Would you kill? By the end of the book, Mitch has his answers and has maybe even surprised himself. 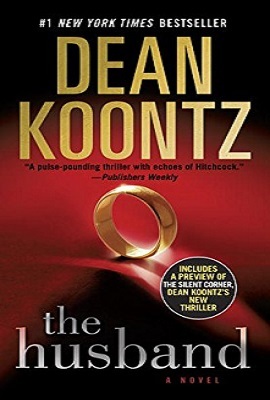 The Husband is probably more a thriller than a horror story, but it is a very good book that should appeal to many readers.